Learn about the options of private browsing (secret surfing) in various major browsers. These options help you in hiding your surfing track to some extent. You want to keep website tracking at bay by disabling cookies etc. Nowadays, all major browsers give you option of browsing Internet in private mode. In private mode, browser does not keep history of what you browsed, it does not store temporary files (like images) in cache, it does not allow cookies and likewise your browser will try to hide your traces. Google creates great products. Chrome browser is just one of them. In Google Chrome, secret mode is called InCognito Browsing. When you select InCognito option, a new Chrome window opens up. Whatever you will browse in this window will remain under the wraps. All the tabs opened in InCognito Chrome window will remain private. An Incognito window can be identified by an image of a person in disguise (raincoat, hat and dark glasses), in the top left corner. To stop private session, close the InPrivate window. This browser gives you options to open a new private window or a new private tab. You can select whichever suits you better. The option are available under Tabs and Windows submenu. To stop private session, just close the private tab or window. To start a private browsing session in Safari, you would need to go to Edit menu and then select Private Browsing option. Safari will ask for confirmation before going private. To stop private session, again go to Edit menu and deselect Private Browsing option. 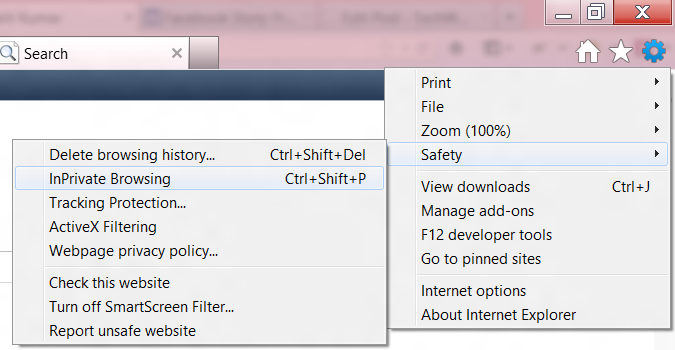 This is how you can secretly browse Internet using various popular browsers. However, such browsing is not completely secretly. So don’t reply on these methods if you are on a mission critical. These private modes just hide your trail on the computer you’re using. But out there somewhere things get recorded on ISP server etc. Please feel free to ask me if you have any questions on this topic. Thank you for using TechWelkin. Thank you sir for briefing such great information about technology.